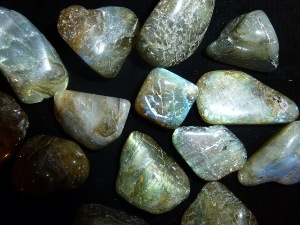 Labradorite tumbled to a smooth finish, an ideal pocket size stone, small enough to carry around with you. Tumble Stones can also be placed around the home for their energies or can just be nice decorative items. 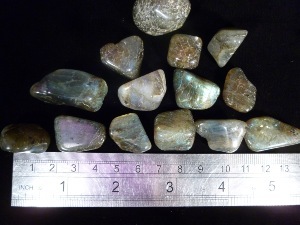 Labradorite crystal gemstones of varying sizes and quality selected specially for your order. Tumble stones are so called because a number of stones of similar sizes are placed in a barrel which is rotated or "tumbled" at a speed and after a period of time which varies between 3 - 5 weeks dependant on the hardness of the stones they are polished from rough to smooth.